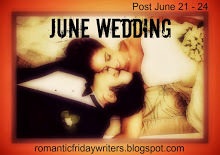 It's time for RFWer's JUNE WEDDING challenge. This challenge is open to everyone - fiction writers, poets, non-fiction writers. You may submit more than one entry, but in two different genres - e.g. one prose, one poem...THIS IS A PRIZE CHALLENGE - A $5 Amazon Gift Card and a 1,000 word CRITIQUE by your hosts will be awarded/announced Friday June 28th on the RFW blog. For my entry this month I have chosen to relate a true story. I have permission to use real names and photographs. June was so thankful to have a few minutes to herself; she had been surrounded by people petting and fussing and talking so much that she nearly yelled at them all to leave her alone. She let out a heavy sigh as she gazed out of her bedroom window on to a beautiful summer’s afternoon. She hadn’t been able to eat anything for breakfast let alone the quick sandwich for lunch that her mother tried to get her to eat. The butterflies in her stomach were tumbling over each other and rising up in her throat every time she thought about the next couple of hours. She knew she would spend the rest of her life with Nelson but she had to get through this day first. He was so handsome and would look so dashing in his sailor’s dress uniform, dark haired, tall and strong, a romantic looking man but that’s as far as it went with the romance. 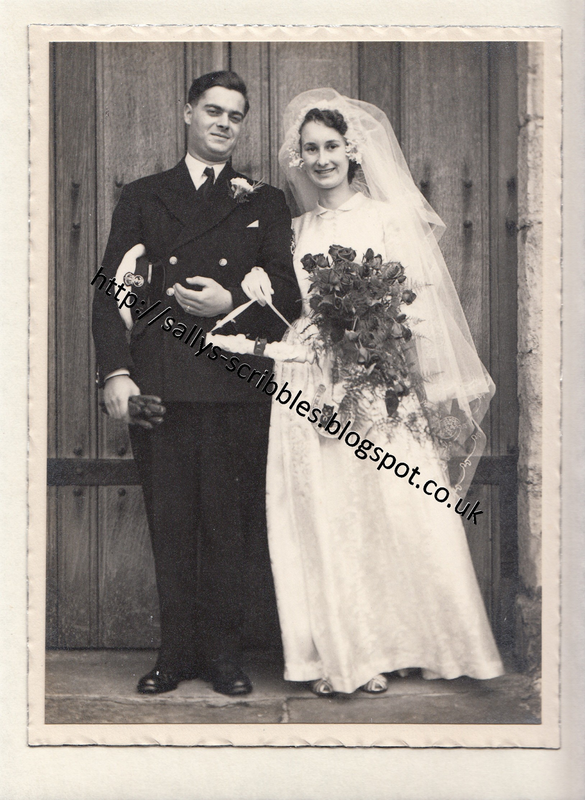 He didn't actually propose but said things like ‘when we are married’ or ‘after we are married.’ He’d posted her engagement ring to her when he’d stopped off in Bravington’s the Jewellers in King’s Cross, London on his way back to his ship. Still you couldn't have everything and he did have prospects, as her father had said when he gave his permission, as a Petty Officer in the Royal Navy. 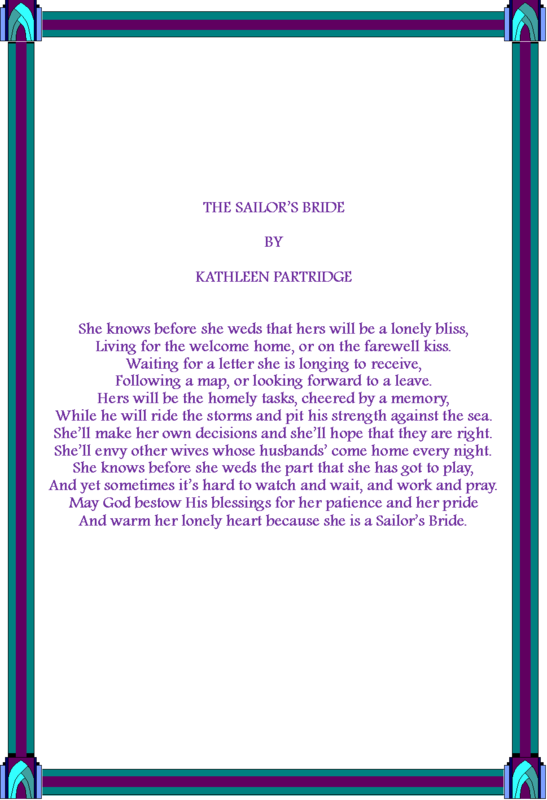 There was a knock on her bedroom door and her cousin, Ivy, burst through the door full of energy. The two cousins shared a smile although Ivy was a few years older than June and already married with the two girls. They had seen a lot and were still feeling the effects of World War II and the on-going rationing. June’s mother, Harriet, had made her wedding dress and Ivy had made both her daughters’ dresses. June’s bedroom became a flurry of activity to rival the butterflies that were doing all sorts of acrobats in her tummy. Harriet, Ivy, Margaret and the two little girls left for St. Mary The Virgin church. Aunt Flo, bustled up to June and whispered, ‘I’ve got something for you to take to ease your nerves.’ June trusted her aunt so she swallowed the proffered pill. They soon took effect as June’s body became very calm and she seemed to be slightly floating above her body. She was happy now and smiled and smiled at everyone. Fred, her father, said, ‘you look beautiful.’ He took her arm and led her out to the wedding car. The church bells were ringing out across the village as June and her dad, Fred, entered through the heavy oak door. She half walked, half floated down the aisle on the arm of her father and stood next to Nelson, who was grinning like a Cheshire cat. The ceremony went by in a flash. She was grateful that Uncle Tom had chosen three hymns but her mouth was so dry she couldn't sing any of the words. She was also thankful they’d paid for the organist and the choir boys who helped the music along. She could see the young choir boys fidgeting in the stalls because they wanted to get away early to go to football practice. They walked to the vestry to sign the register and she quietly said her new surname to herself over and over again. 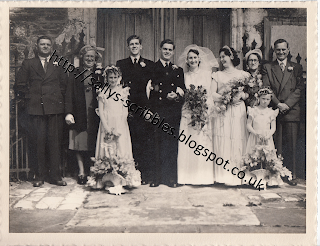 Her silver sandals peeked out from beneath her satin brocade white dress, with its Peter Pan collar and pearl buttons down the front, tapping gently on the flagstone floor of the aisle as she walked through the church on the arm of her new husband. June and Nelson stood outside the huge oak door to pose for the first of many wedding photographs. Her arm was hooked through Nelson’s arm so only her white cotton glove peeked out in contrast to his dark navy blue No.1 dress uniform. Her bouquet of freshly cut red roses cascaded down the front of her dress adding a splash of vibrancy to her wedding outfit. June kept smiling, clinging to Nelson’s arm as the call came for a photograph with the bridesmaids and immediate family. Her younger sister, Margaret, who had married the previous March, was now standing proudly by her side as her Matron of Honour with the two small bridesmaids, resting their heavy wicker baskets adorned top and bottom with satin ribbons, full of freshly picked sweet peas. 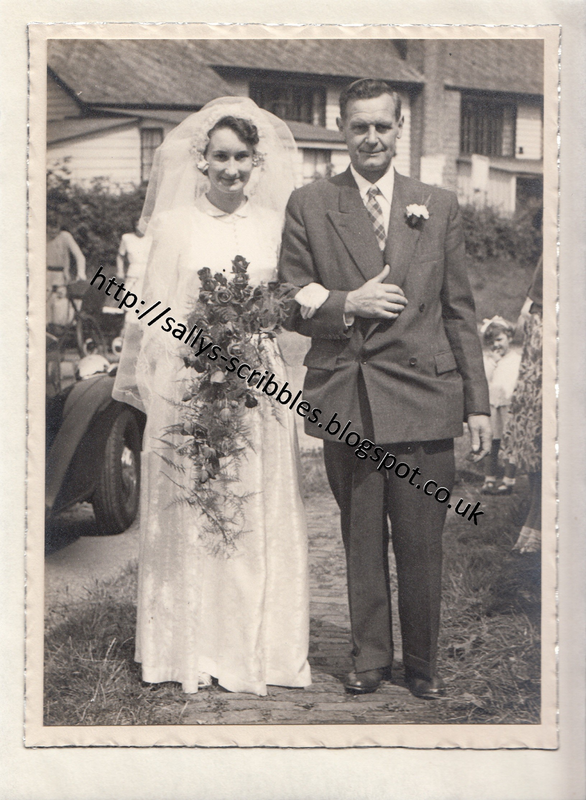 The very short trip across the road to the Church Hall for the reception was made in the bridal car as Fred had stated that his daughter was not walking across the road to the hall. The confetti and rice were thrown with gusto by the wedding guests over the bride and groom as they proceeded to get in to the bridal car for the minute’s drive to the reception. The three-tier wedding cake, baked with love by her mother and made with donated food coupons from customers where she worked had been saved for months by family and friends had provided the dried fruits. It was professionally iced by the local baker and took pride of place at the head table. June and Nelson will be celebrating their Diamond Wedding Anniversary (60 years) on 1st August 2013. They will receive a telegram congratulating them on their Diamond Wedding Anniversary from Queen Elizabeth II. Although they now suffer from some physical ailments ranging from severe arthritis, mobility problems, asbestosis, diverticulitis and age related diabetes, they are a very independent couple and are looking forward to celebrating their special day with their friends and family including their great-grandchildren at a special lunch time gathering in August. This wonderful poem was cut out of a woman’s magazine by a family friend and inserted into the wedding card along with a wedding present of brand new linen sheets and presented to June just before her wedding day. June has kept the poem all these years and I reproduce it here. Wow! 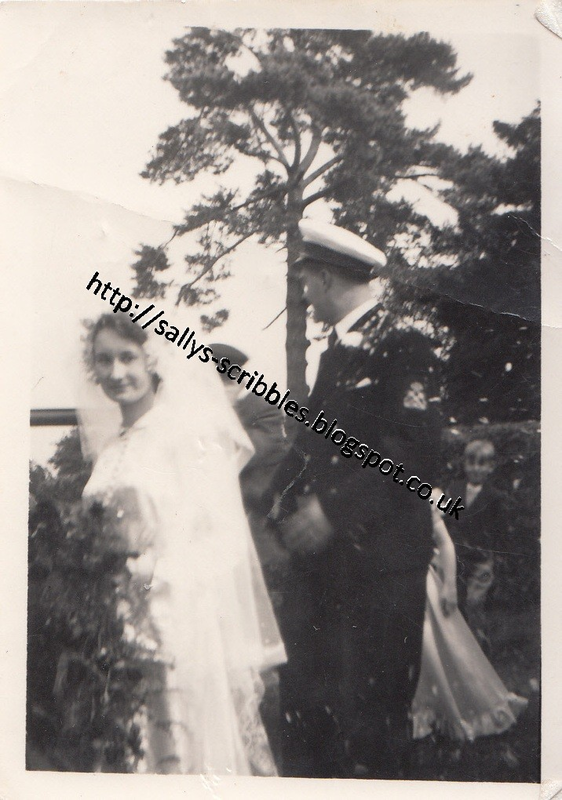 This is a wonderful post and tribute, Sally. Please pass along congratulations from Oregon to June and Nelson. I love the group photo; they all look so happy. I agree. What a lovely story! Happy anniversary to them! Happy Diamond Anniversary to June and Nelson. What a wonderful tribute Sally. I am so glad to get at least one post like this with that historic flavour we can relate to if we are of western culture. Very familiar looking photographs to those of great grandparents we have on our walls. Turned out to be a real love story in the end didn't it? Thanks for posting for RFW. Very sweet Sally. I enjoyed this glimpse of a wedding in another era, and it did bring back childhood memories of weddings in my own Baptist church when I was growing up. 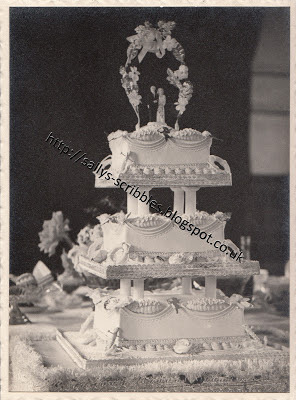 My mother made wedding cakes, multi-tiered like the one in this photo, and often she wasn't paid, or made barely a quarter what they were worth. Thanks for participating with RFW this month Sally. And convey our thanks to June for allowing you to share her Wedding Day with us. Charming! the love story and your account of the wedding both. A lovely tribute. My FIL was a "sailor", so I can see my MIL in the poem. Enjoyed your entry. Lovely, lovely wedding, it brought back memories of my own, not as formal but beautiful in the simplicity. So wonderful to see the photos and experience the butterflies. 60 years is amazing and awesome and definitely needs to be celebrated! Absence, sometimes does make the heart grow fonder! It's good to see pictures from way back when and to know that this couple is still going strong in their marriage. The photos helped bring the story to life. Good stuff. I love this true story with the photographs and poem. My former husband was in the Swedish merchant marines, and spent many years working as chief engineer on different ships until he finally got a land job and never went to sea again. 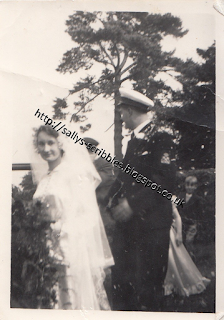 But the first two years we were married he was still sailing and took tours over the North Atlantic keeping him away from me for several months at a time, during which time I miscarried. I hated his job and regretted marrying him because of it. I was lonelier than before we were married. Still, our marriage lasted 19 years until it ended in divorce two years ago. I have only recently stopped wishing that I could turn the clock back and make other choices. The children, are the one thing that make me happy that I was married to him at all. When I think of my own experience, and then compare it with all of these wives to sea-going men, my heart goes out to them. Their lives have not been easy, being left alone at home waiting; and the wait was longer during the war. I love your story. You have taken a true story and treated it with respect. Love all of the nearly invisible details that say so much about this time in history and these particular people. One telling observation that the groom was handsome, but only looked romantic, as he never proposed properly, but just assumed that there would be a wedding! This sounds just like my former husband; this inability to to put into words what needs to be said. I wish June and Nelson all the best on their special day in August. From reading this text, I've decided that you, Sally, would be the perfect critique-buddy for me, if I decide to try to write a novel or non-fiction story set during WWII. You have used several words here that I needed for my wedding story, but had difficulty remembering what they were in English and could not find in the dictionary. One of these words is 'vestry'! All I could think of was 'vapenhus' and it translated as 'church porch' in my Swedish-English dictionary. You write in a good clean, clear style that suits this subject matter well. So wonderful! Thanks for sharing.